While there are many different infrared grills on the market, brands like Soliare and TEC typically carry a premium price. For more budget-minded consumers, Char Broil offers similar features at a very compelling pricepoint. Char Broil offers three different infrared gas grill models, the Quantum, the RED, and the Heatwave. The RED and Heatwave use the same infrared grill burner design, while the Quantum uses a different design. The Quantum Char Broil infrared grill utilizes a burner design similar to that found on TEC grills, except the glass barrier used on TEC grills is replaced with a perforated metal shild on the Char Broil. While a burn-off is still possible for the grates, some users feel the perferated plate might require a bit more maintainance than some other options on the market. 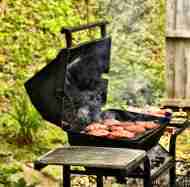 Otherwise, the these Char Broil grills have all the benefits of a modern infrared grill at pricepoints from $400-800. The RED and Heatwave Char Broil grills use a somewhat different design with a non-perferated emitter that spans the grill surface. The emitter is U-shaped over each burner. This has the advantage of no small holes to clog like the Quantum, but may collect grease. At this point, it is unclear which design is better overall, though the RED and Heatwave models sell for slightly higher prices. Look to spend $600-$1000 on one of these models. The RED model is primarily sold through Home Depot, where as the Heatwave is available from a number of different retailers. Both models offer propane and natural gas options, though expect much lower heat output when using natural gas. Many people that have tried running a Char Broil infrared model on natural gas have been disappointed that the heat level really isn't all that different than a traditional gas grill. Char Broil grills have a mixed reputation as far as build quality. Construction is typically a combination of steel and stainless steel. Typically 304 grade stainless steel is used, not the more expensive and durable 316 stainless. The residential models different warranties on the overall construction and burners. This is not to say that they are poorly built, just that they are a step down in quality from some of the premium brands that sell for premium prices. Many grill buyers would like to take advantage of all the features an infrared grill can offer, but lack the financial resources to pay $1,000 or more. If that sounds like you, a Char Broil infrared grill definitely belongs on your short list to consider.